Office 365 operated by 21Vianet: How do I get the new Office 2016 apps? With the release of Office 2016, you can now get the latest version of Office on your PC or Mac if you have an existing Office 365 for business subscription, install Office 2013 instead, or sign up anew. Note: Note If you don't see an option to install Office 2016, Office 2013, or Project or Visio, contact your admin. If you're the admin, see Manage user software in Office 365. Select what Office product you want to upgrade. If you're not sure what version of Office you're currently using, see What version of Office am I using? There's nothing for you to do. Your admin or IT department will likely continue to manage your installations and updates. Uninstall Office following the steps in Uninstall Office 2013, Office 2016, or Office 365 from a PC . Install Office following the steps in Download and install Office for PC. Open an Office 2013 application. For Office 2013 Click-to-Run installations, you'll have an Update Options button. MSI-based installations don't have an Update Options button. These installs only show an About <application> button. Uninstall Office 2013 following the steps in Uninstall Office 2013, Office 2016, or Office 365 from a PC. 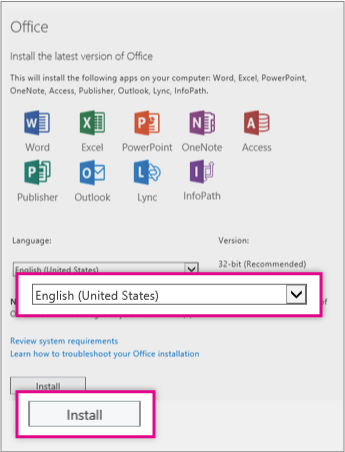 Install Office 2016 following the steps in Download and install Office for PC. Uninstall Project following the steps in Uninstall Office 2013, Office 2016, or Office 365 from a PC. Install Project by clicking Other Installs on the Office 365 home page, and then click Project. Then, just choose your language and click Install. Note: Don't see Project for Office 365? Ask your admin to assign you a license and permissions. Open the Project 2013 application. For Project 2013 Click-to-Run installations, you'll have an Update Options button. MSI-based installations don't have an Update Options button. These installs only show an About Project button. Uninstall Visio following the steps in Uninstall Office 2013, Office 2016, or Office 365 from a PC. Install Visio by clicking Other Installs on the Office 365 home page, and then click Visio. Then, just choose your language and click Install. Note: Don't see Visio for Office 365? Ask your admin to assign you a license and permissions. 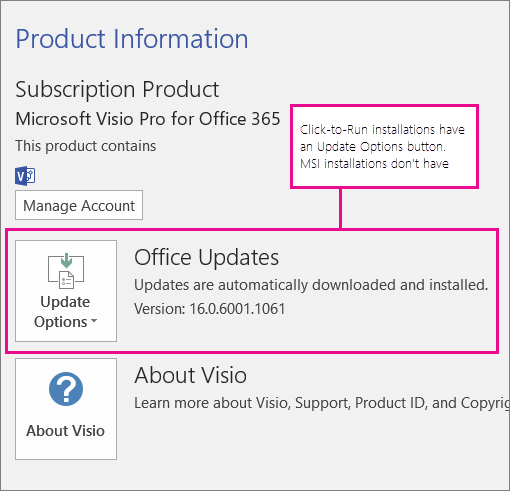 For Visio click-to-run installations, you'll have an Update Options button. MSI-based installations don't have an Update Options button. 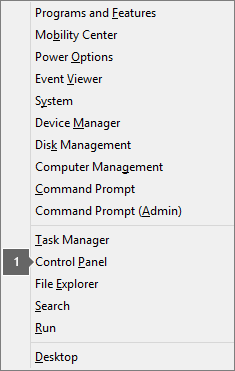 These installs only show an About <Visio> button. Click Programs > Programs and Features. 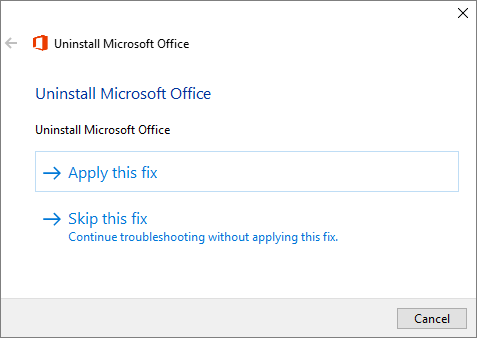 Right-click the Office application you want to remove, and then click Uninstall. If you have problems running the easy fix tool, switch to Internet Explorer or Edge (Windows 10) as your browser. Click this easy fix button to uninstall and completely clean up your Office installation. When prompted by your browser, choose Open. If the file doesn't open, choose Save > Open Folder, and then double-click the file (it should start with "O15CTRRemove") to run the easy fix tool. The Uninstall Microsoft Office wizard launches. Select Next. Select Apply this fix, and then follow through the rest of the screens. Important: If you don't see this screen, you'll need to switch to Internet Explorer or Edge to run the tool for now. This issue is being addressed. On completion of the easy fix tool, you'll get an Uninstallation successful screen, and then be prompted to restart your computer for the changes to take effect. Select Next. 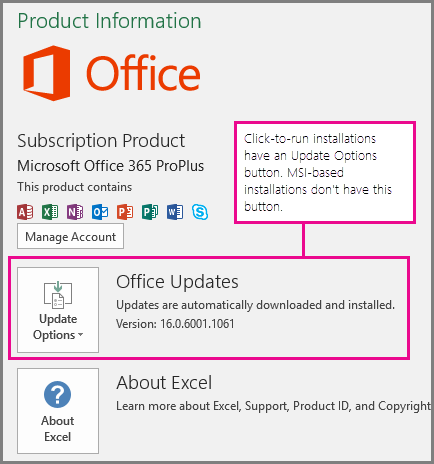 Important: The process that installs Office 2016 also uninstalls all Office 2013 products. As you might expect, Word 2013, Excel 2013, and the rest of the Office suite are uninstalled. In addition, if a computer has InfoPath 2013, SharePoint Designer 2013, or certain versions of Visio 2013 or Project 2013 installed, installing Office 2016 also uninstalls those programs. You won’t be able to reinstall them. Sign in to Office 365 operated by 21VianetOffice 365 at https://portal.partner.microsoftonline.cn/OLS/MySoftware.aspx. If you don't see Office listed, your plan probably doesn't include Office applications. If you know your plan includes Office, you may not have a license assigned. Ask your Office 365 administrator to assign a license to you. On the Office page, select a Language, and then choose Install to install the 32-bit version. At the bottom of the screen, select Run. Follow the prompts and accept the license agreement. When you see "You're good to go," select All done. Follow the steps to install Office 2016 on a Mac at Install Office 2016 for Mac with Office 365 operated by 21Vianet.